Note: The style of dress in this photo predates the invention of the Cabinet Card, so I believe that this is a reprint of an older photograph. Her sleeves, while not completely out of style in the late 1850s and early 1860s, were certainly unusual for the time. They are probably made in two parts- the top section sewn onto a tight lower section. I am not aware of a specific name for this cut of sleeve, either period or modern. Gigot or leg’o’mutton always seemed to me to most accurately describe the one-piece sleeves that are puffed at the top and narrow at the cuff (after all, a leg of lamb is in one piece!). At first glance this woman’s sleeve resembles the gigot, but I think the shape is different enough that it deserves another name. Her full skirt is worn over a wide hoop or cage crinoline. The skirt is knife-pleated into the waist, with the pleats facing towards center front. Her skirt is trimmed in several horizontal bands. I can’t tell exactly what the trimming is, but a good possibility is that it is rows of self-fabric ruched up the center to from two puffs, and outlined top and bottom with velvet ribbon. She wears a watch fob suspended from her belt- the watch is tucked into a small, vertical watch-pocket. The majority of watch-pockets that I have seen on original garments are horizontal and on the left side of the dress (PL), but vertical pockets do show up occasionally. Her dress is finished with narrow, flat white collar, pinned at the throat with a brooch. Hair: Instead of trying to tame naturally curly hair into the smooth hairstyles popular during the mid-victorian period, many curly-headed women preferred to wear them in controlled ringlets. We would call them “banana curls.” This woman conforms to the style of the period by center-parting her hair, oiling it, and setting it into uniform ringlets. Dress: This woman wears a one-piece dress composed of a bodice and attached skirt. The fabric could be wool or silk or a mixture of the two. The bodice is dart-fitted and closes at center front with hooks and eyes. Decorative buttons spaced approximately 3/4″ apart line the placket. Her sleeves are the modified pagoda style we have seen so often in this blog. They are trimmed with narrow ribbon or braid to form a mock cuff. The skirt is pleated, hangs about 6″ from the floor in front, and dips slightly towards the sides and back. The hem is covered with a wool tape to prevent fraying. She wears a thick necktie with the band exposed and relatively high on her neck. This neck height is typical of mid-to-late 1860s fashion. Her white collar and undersleeves match each other, with a tiny row of dots around the edges and cuff. These dots could be contrasting ribbon woven through eyelets, but there many other possibilities for how it was done. Her only visible jewelry is a pair of drop earrings. Hair: Her hair is center parted and arranged in a peculiar horizontal curl or wave over her ears. She may have matching combs and ringlets down the back, but the photograph is too unclear to see exactly what is there. Backmark: I. G. Owen Newton, N.J. “Negatives Preserved” Additional Copies from the plate from which this picture is taken can be had at any time if desired. Note: Photo taken at the same studio as the Woman in Plain Silk. Dress: Perry wears a one-piece dress composed of a bodice attached to a skirt. The fabric is printed with a regular pattern of small flower bunches or geometric shapes in straight rows. The fabric may either be wool or silk or a mix of the two. The drape of the fabric, especially in the sleeve, looks to me like wool. The bodice is darted and closes at center front with hooks and eyes. Note that the two fronts are poorly matched, indicating that Ms. Perry made this dress herself or hired a less-skilled dressmaker. The sleeves are wrist-length in a wide sleeve, which may either be classified as a modified pagoda, or an extra-wide two-piece coat sleeve. The sleeve is pleated to fit into the armsyce, and hangs clumsily around the arm. The skirt is floor-length and appears to be knife-pleated. The hem is bound with wool tape. The dress is trimmed with wide box-pleated ruching over the bodice and down the sleeve. She wears a belt -colored blue in the original photograph- and a watch tucked into the belt, with the fob hanging below. She is probably wearing undersleeves, though they are not visible, and she wears a narrow flat collar fastened in front with a brooch. Hair: Her hair is center parted and combed low over the ears. At about ear level her hair is rolled towards the face slightly, creating just a hint of a puff. She wears a headdress of decorated hairnet, and drop earrings. 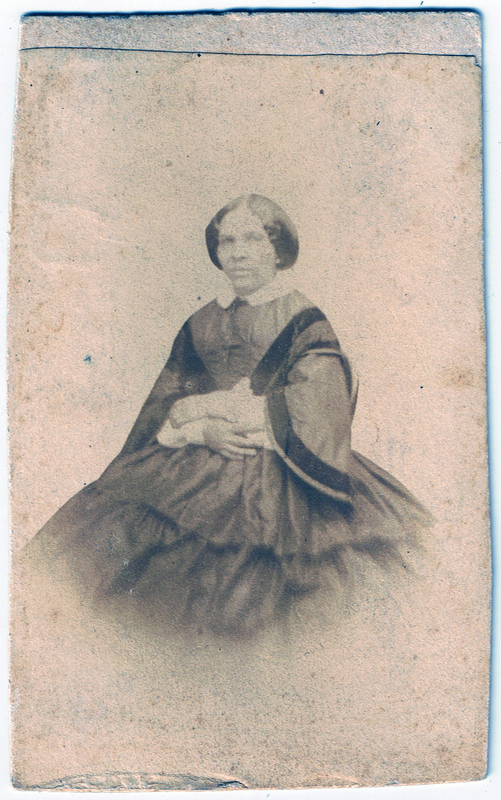 Note: This CDV is from the same photography establishment as Kate E. Perry. Dress: One piece dress composed of bodice and attached skirt. Most likely silk, with a hint of a woven figure on the chest, although it is difficult to tell if this is an actual jacquard from the photograph. Numbers of original garments show that delicately figured, single-color silks were common in the early 1860s. The bodice is darted and closes at center front with hidden hooks and eyes. Her sleeves are modified pagoda. Notice how short they are in relation to her wrist. Sleeve lengths from this period range from over the wrist to nearly at the elbow (though the latter seems to have been mostly a result of remaking old dresses and not having enough fabric). She wears a very narrow white collar, with the neckline of the dress peeking over, which indicates that the collar is probably just pinned on top of the bodice. The front closes with a brooch. She also appears to be wearing a plain belt without a clasp or buckle. Her skirt is pleated into the bodice with narrow knife-pleats, facing towards center-front. The skirt is worn over a cage crinoline, and is finished at the hem with a wool tape to prevent wear on the dress fabric. Hair: Her hair is center-parted, combed low over the ears, and pinned back into a coil at about the hairline level. Her hair looks slightly old-fashioned; hairstyles with the greatest width over the ears and ending abruptly near the earlobe was popular in the 1850s. Dress: This dress is probably made of silk taffeta, one of the most popular fabrics for dresses in the early 1860s. The bodice is darted and opens in front, as nearly all dresses of the time do (for women. Girls’ dresses open in back). The sleeve is a version of the “modified pagoda,” as it is known to modern costume historians. A wavy edge winds its way from the front of the shoulder to the wrist. There may be a series of pleats at the top of the cuff, which serves to gives the sleeve a attractive upward curve. The skirt is gathered or gauged, and trimmed with a deep box-pleated flounce of self-fabric. The only other trim on the dress is ribbon or braid on the sleeve. Hair: Center parted and combed down to form a slope across the sides of her forehead and smoothly behind her ears. Bound in back in a coil, and covered with a decorated hairnet. Location: Unknown. Purchased in Paris, France. Note: This is the same woman as in my previous post. Because of the strange quality of the image (it looks like it was cut away from a green-screen) and the mid-to-late 1850s styles, I think it may be a print taken from an earlier glass-plate image. This woman wears a plain silk taffeta dress with wide velvet ribbon trim. The bodice closes at center front with hooks and eyes and is darted to fit. Her sleeves are fitted at the armscye and flare out wide at the cuff, a style sometimes known as a “pagoda sleeve.” There appears the be a narrow cap at the armscye. Caps are usually unlined pieces of dress fabric, and are used to extend the visual line of the shoulder. Her skirt has two visible flounces; there may be a third at the bottom that we cannot see in the photograph. Flounces were often applied to a base skirt by running a cord through a channel at the top of each flounce, gathering to fit, and then top-stitching on. She wears white undersleeves basted into her dress and a 1.5″ wide white collar, which shows just a hint of embroidery. A dark spot at center front and neck indicates that she might be wearing a brooch there. Her hair is parted in the center, and combed smooth down over her temples, rolled towards the face, and then back into a coil at the nape of her neck. The slight waves at her temples are probably natural. Her only visible jewelry is an earring, and that is difficult to make out.